The wind came howling through the valley at 2:20AM followed by a hard rain. My heart went thud at these sounds as with morning light came a 30″ truck we had been given by LandAir Express out of Burlington to fill with warm outerwear for people recovering from Sandy’s wrath. I pictured locals stopping by the parking lot to deliver what they had removed from their closets and cleaned for the trip south … in the freezing rain. We only had this one shot, and we wanted it to be good. We had survived Irene with lots of outside help, and it meant a lot to us to help these guys. There it is. 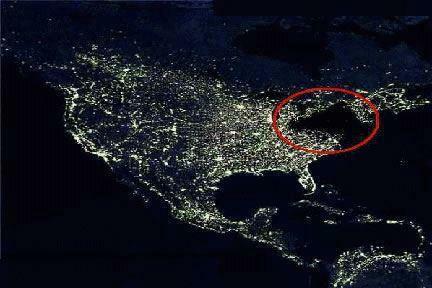 The big cold dark spot in NJ and NY where thousands of displaced people are battling the cold. Well the morning light did come hours later, and in the dark I had made mental notes about where to find a few pop up tents to keep things dry, and where to get tables to keep clothes off the ground while we sorted into the big bins that would be shrink-wrapped and sent south to the National Guard on Staten Island for distribution. People here were generous beyond belief. Bags large and small started coming into the parking lot delivered by friends we knew or shortly would know. Twice vans arrived from clothing stores filled with coats still tagged for sale. One sweet lady knitted a dozen warm soft hats to send, another came with just two precious spare hats. Everyone cared. The truck began to fill from the front to the back with warmth. Many people stopped by for periods of time to help with the sorting. We are an infectious lot when we get fired up. The truck driver got into it with us and never stopped helping, even though his day was the longest as he had the drive the truck on either side of a hard working day. This is our beloved valley though, home of Sugarbush and Mad River Glen, hiking, soaring. ski joring, music, food & the arts, and 35 hundred of us who will always rally for our neighbors. The party was on in that cold parking lot by Shaws. For 7 hours we packed the truck, hugged our friends, laughed at each other and kept sending the warmth south. We all had a great day, and the best part is that I believe that we really did make a small dent in helping. This is who we are, we couldn’t have done anything else. I can’t wrap my mind around the whole solution down there, but you can count on the fact that the next time we get a good idea of how to help, we will do that too.